Sheet Vinyl Spot Cleaning Guidelines | Wolfe Flooring Inc. 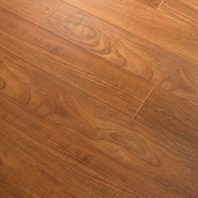 Following six basic guidelines will limit the potential damage to vinyl flooring. Tend to debris, stains, and spills as quickly as possible. Debris grind the surface and stains set harder with time. Use a dry method of sweeping or vacuuming for dry debris (e.g., dirt, sand, ash, toner, or powder). 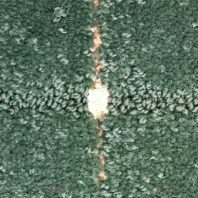 An early application of moisture on dry particulate may make the problem worse. Blot or wet-vacuum liquids to avoid spreading the problem. Only after you have extracted as much as possible by blotting or vacuuming should you potentially introduce a water or a liquid cleaner; otherwise, an early application of moisture may expand the problem wider. Use a white, clean, absorbent towel. The vinyl's surface can become permanently scratched by using a rough scrubbing or scouring pad. Use a cleaning agent that is as mild as possible to ensure that your vinyl is not ruined by the cleaning agent. Start with only tap water (which is almost a neutral 7.0 on the pH scale). If water alone is insufficient, try a diluted, mild, alkaline cleaner (pH 7 to pH 10). Consider Windex® Original or Glass Plus®. Carefully follow the instructions if you use an over-the-counter vinyl cleaner. Apply the cleaning agent to a white cloth. Then, use the cloth to remove the stain. Sixth Guideline and Last Step: Rinse. When finished, leave the floor free of cleaner residue and as dry as possible by rinsing and again blotting with a dry towel. 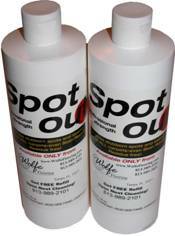 Use a clear solvent-based product to remove petroleum-based problems or isolated, shoe scuff marks. Petroleum byproducts include some inks, paints, markers, crayons, cosmetics, lipstick, lotion, sunscreen, furniture and shoe polish, lubricant, oil, grease, asphalt, and tar. Solvent-based cleaners include rubbing or isopropyl alcohol, mineral spirits, lighter fluid, or acetone (as found in fingernail polish). Again, apply the solvent to a towel. Then, use the towel on your vinyl. CAUTION: Solvent liquids are flammable. A solvent can ruin vinyl if allowed to seep into the joints. First, use ice to harden the candle wax or gum. Then, use the edge of a wooden, plastic, or Teflon spatula or a credit card to scrape off the gum or wax. If hardening the gum or wax does not work, use warm water and liquid handsoap to remove the wax or gum. Another alternative is to soften or emulsify the gum or wax using a cooking oil (coconut, olive, canola, or vegetable oil), an oily food (e.g., peanut butter or mayonnaise), or petroleum jelly (e.g., Vaseline®). If you use an oil, use a mild detergent or Windex® or Glass Plus® to remove the oil residue. Wax or gum can also be removed with a solvent, such as WD-40, adhesive remover, mineral spirits, or a citrus cleaner. Do not allow your cleaning product to seep into the joints. Although vinyl has good stain resistance, vinyl may be vulnerable to janitorial chemicals and industrial products, including strong acids or alkalines, bleaching agents, acne medicine, food or hair dyes, solvents, pesticides, petroleum byproducts, and more. Tar and asphalt residue can permanently yellow rugs, carpet, stone, hardwood, laminate, vinyl, and rubber flooring. Read: How to Maintain Commercial Sheet Vinyl for general maintenance instructions. Read: How to Maintain Residential Sheet Vinyl for general maintenance instructions.